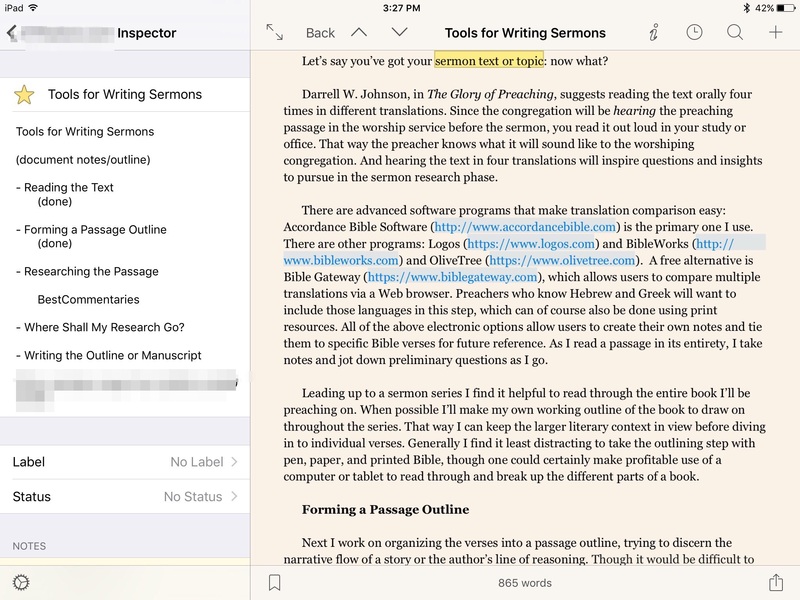 Scrivener for iOS continues to receive rave reviews in the App Store. For good reason. Here‘s my mini-review of the app, if you want to see what the hype is about. Today I’m posting just to say I’ve got a free download code to give away to one lucky reader. A week is a long time to wait for giveaway results, so this one is quick–I’ll announce the winner Friday at 5:00 p.m. EST. I’m working on the biblical validity of “unction” in preaching and then applied through a historical perspective specifically the Great Awakening and the 2nd Great Awakening. I am working on lecture notes for a Romans class in the fall. I am still on the fence about using Schrivner, but maybe winning this will push me over! Hi Abram, I’m working on policies for a new ministry in my local Church. Thanks for the chance to win! Blessings! I’m writting a review of Frank Lloyd Wright’s Darwin Martin complex in Buffalo, New York. I’m working on writing my church history class notes. I’m writing a paper on Galatians right now. I’m right now working on a script & a screenplay based on criminal psychology & social prejudices. So I’m so keenly looking for this. Yo. I’m writing notes on Greek and Hebrew. I’m fifty something and just recently discovered I’m supposed write. Scrivener is helping me to learn how to do that. I’m writing about the life sciences research we do in a little corner of this world, named Chile. Unfortunately, only using scrivener for Mac, since the ios app is not available in the Chilean app store…oh well. Thanks for the comment, and I hope it becomes available soon!